Ais & Mayaimi Each Ais town had its own leader referred to by a native word that the Spanish translated as “cacique” and the English as “casseekey.” These leaders were most likely the heads of the most respected matrilineal families or clans in their villages. For the most part, these town leaders seem to have ruled only through the power of suggestion rather than the threat of force. Ais villages or towns are described as consisting of small collections of huts framed with wood or sticks and covered on the tops and sides with a thatch of palm fronds. At least some of these huts were located on top of shell mounds. There seems to have been little difference in the houses of Ais caciques from the rest of Ais villagers except that the houses of the caciques were larger and contained more furniture. Both Ais men and women wore their hair long and frequently painted parts of their bodies with black and/or red paint. Men usually wore their hair pulled up into a knot near the tops of their heads. At least some Ais men wore beards. Spanish accounts report that the paramount Ais cacique wore a broad gold headband and his leading men wore smaller ones. 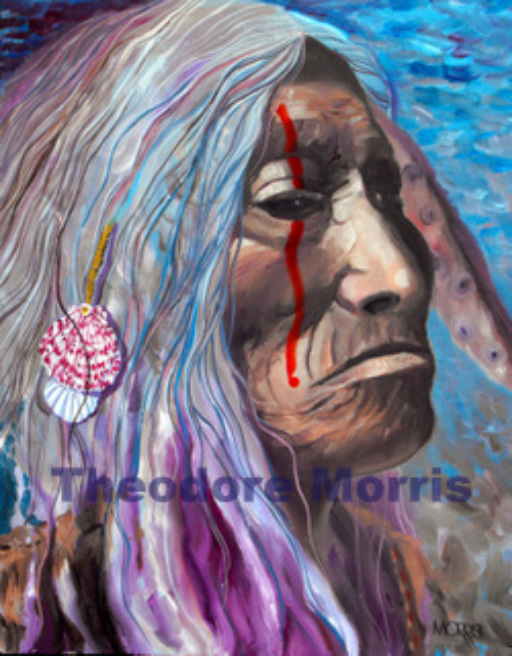 This painting portrays an elderly Ais warrior. His wisdom and alertness are symbolized by his headdress. The light and dark colors in the painting are used to emphasize the strength of this individual. He would have been an elder in the Wolf Clan. "...they are rich only by the sea, from the many vessels that have been lost well laden with these metals ( gold & silver)..."
This painting portrays an event that took place in 1696 near present day Vero Beach. Two of six esteemed men are at the beginning of a ceremony of dancing and singing. The background only hints at a surrounding mangrove forest. · Shell & copper beads. This ancient tribal member recalls his many exciting hunts. This painting was done very quickly so as to capture my impression of the old, worn-out hunter. The loose painterly quality gives the impression I was there capturing his likeness. 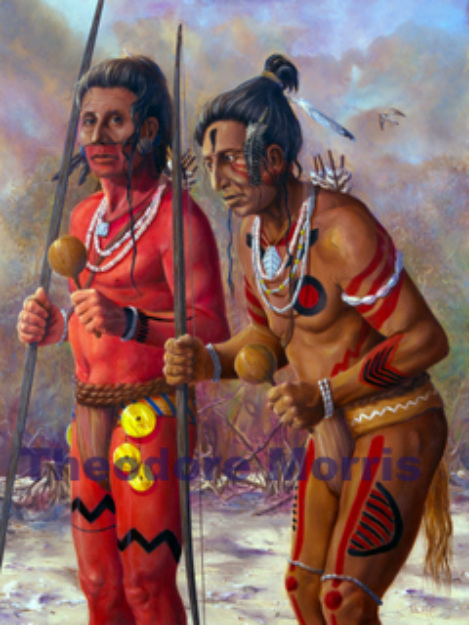 The Mayaimi were subjects of Carlos the king of the Calusa tribe, to whom they paid tribute with gifts of food, animal skins, root tubers, and other goods. 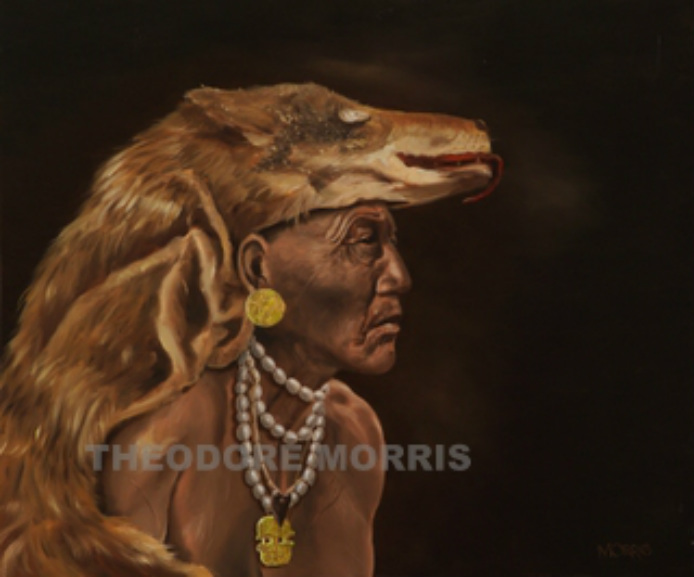 This painting shows a warrior whose tribe is subservient to another. 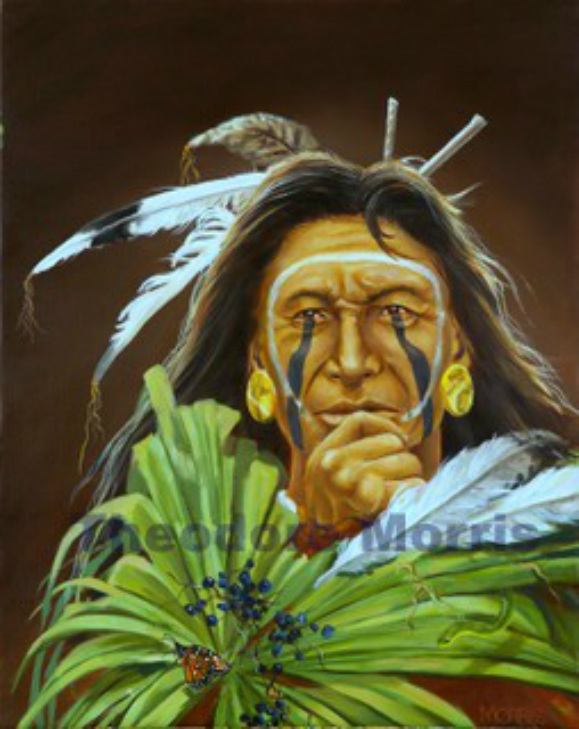 His face paint shows his tribal affiliation. ''...very tall, handsome, and well proportioned without any defomity...Their hair is very black abd grows down to their hips." This tribal member was one of a small group of principle men who counseled with the chief in decision making. During receptions for visiting dignitaries, he would “paint himself and dress his hair.” I concentrated on the skin color values and contrasted this to the simple background colors. "Toward the north of the martires end near a place of the Indians called Tequesta, situated on the bank of a river which extends into the country the distance of fitteen leagues, and issues from another lake of fresh water, which is said by some Indians who have traversed it more than I, to be an arm of the Lake of mayaimi." In his journal recording his adventures on the east coast of Florida after being shipwrecked in 1696, Jonathan Dickinson described the activities of the 3rd day of a men's dancing ceremony. 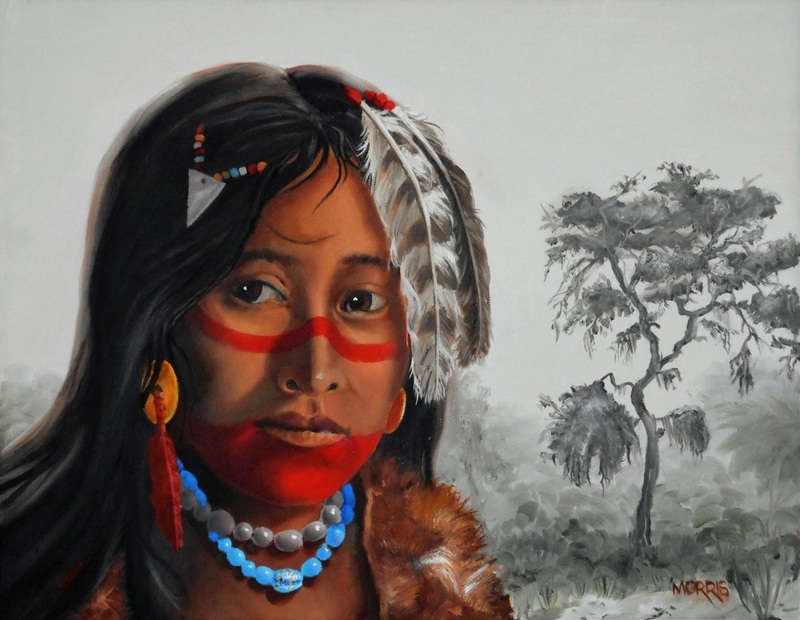 I painted this innocent girl as she walks around the village that contains visiting members from other tribes. This Cacique (chief) is preparing for a ceremonial dance as described by a shipwrecked Quaker named Jonathan Dickinson in 1696. The ceremony takes place just south of Stuart Florida. The pole was set up in the earth while six men painted red & black, with rattles and bows & arrows, danced around. "...comes an old man and takes a staff about eight foot long, having a broad arrow on the head thereof, and thence half way painted red and white like unto a barber's pole; in the middle of this staff is fixed a piece of wood shaped like unto thigh, leg and foot of a man, and the lower part thereof is painted black..."
This girl gazes out at the viewer from the scrub environment near Lake Okeechobee [Lake Mayaimi], with a look of concern. She may be given to Chief Carlos of the Calusa tribe, which controlled her tribe.